Sometimes a new Garden Design Plan for the whole garden is not required and to just address the one or two areas of the garden which will make the most impact on the usability and visual appeal of your outdoor space is what is needed. 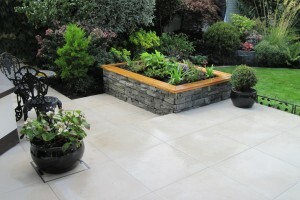 In this garden the clients just wished to re-design the patio area closest to the house to transform it into a real contemporary outdoor living space. 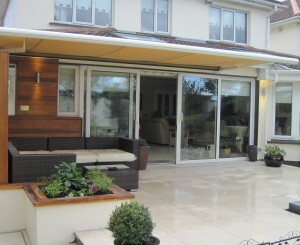 We therefore compiled a Garden Design Plan solely for this area of the garden which is loacted in Castleknock, Dublin. and down the side of the garden to link the new patio to the existing garden. 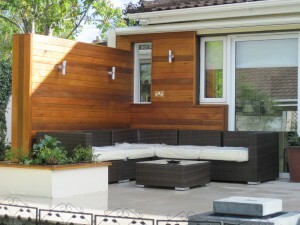 Raised planters were built to soften the design with cedar capping of the walls to compliment the cedar backdrop to the lounging area and to allow them to double as seating if needed. One of the raised planters was built with stone walls to link it to the same stone used elsewhere in the existing garden which enabled us to pull the whole garden together as one cohesive and seemless garden design.